One thing that bolsters California’s tourism is the Napa Valley wine tours. Napa Valley is, of course, a world-famous wine-growing region in the state’s Napa County. The tours around the beautiful scenery, the wine-tasting, and the cuisine are part of Napa Valley’s unique allure. If you haven’t known it before, there are actually over 400 wineries spread throughout the Napa Valley. This may look like an inexhaustible number of wines for wine-loving tourists to delve into! And if they’re not exhausted from visiting the wineries and the wine-tasting, tourists may also want to explore more the beauty of the Valley as well as take advantage of its natural treasures and amenities. 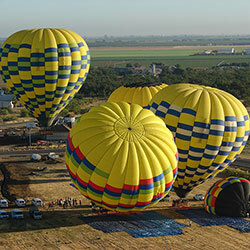 One of the ways to see the beauty of the Napa Valley is during a hot air balloon ride. You may think that in order to see the finest of the Valley’s natural surroundings is to explore it up close. That is true; however, appreciating the beauty of the Napa Valley when you’re up in the sky is something that is truly magical. You’re flying in a serene morning sky, having mixed feelings of adventurousness and tranquility. And with the beauty of Napa Valley below you, you feel you’re in paradise. It’s not a distant probability that you may get carried away by the whole scene! If that intrigues you now, well, we will show you how to get the Napa Valley paradise, from a different perspective that is. If you’ve decided to check on hot air balloon rides during your next holiday trip, choose Balloons Above the Valley (BATV). BATV cares for you, our valued guests. Of course we don’t want you to leave for the hot air balloon site hungry, so we serve a delicious pre-flight breakfast that will get you revved up for the big moment! Our breakfast consists of freshly-baked muffins, fresh local coffee, assorted hot teas, hot chocolate, and other pastries. All good to fill and warm up your stomach and help wake up your senses so that you will be ready for your hot air balloon flight! Then our vans will drop you off at the hot air balloon launch site. You will never feel bored going there because the drivers will take you on the scenic routes, where you see the mist move through the vineyards early in the morning. You will definitely love these breathtaking sights and you won’t be able to resist taking pictures or video clips of the scene while riding all the way to launch site. Upon reaching the launch site, you will be overwhelmed at seeing the daunting task of inflating the balloons. You will be astonished by the big fire spewing upward from the hot air balloons burner, which will help inflate the balloon and make it bigger. As you get aboard on the basket, your thrill will escalate further as the hot air balloon slowly lifts from the ground and up into the air. You may elicit shrieks and we understand that. At first, you will feel a combination of emotions: fear, thrill, and excitement. But our pilots know that and will put you at ease so your initial fears will soon vanish to be replaced by joy and wonder. You thought that you discovered the beauty of Napa Valley on the ground, but your opinions will change once you literally soar over the valley. Over a thousand feet in the air, you will feel as though the hot air balloon is lighter than riding an elevator. The scenery of the Napa and Sonoma Valleys are beautiful. You will see nothing but the almost all-green expanse of the valleys in the summer. There will be neat rows of grape vines, clusters of fruit trees and shrubs, houses and wineries that dot the middle of the vineyards. You will also notice the lakes now look like adorable little ponds. You may get carried away by the gorgeousness of the valley, as well as the peace that surrounds you. The thrill is still there of course, but you will also feel relaxed and at peace at this point. As you are enjoying the sights, don’t miss the time take pictures or videos of the unbeatable natural beauty of the valley with your camera and smartphone. Of course, you can also take some posterity selfies, too! Your guide will also give you some information about the vineyards you pass over as well as important landmarks of the region. After that wonderful flight, a buffet-style post-flight brunch with sparkling champagne awaits you. You and the other guests will be led to a quaint charming patio where the delicious brunch is served. You will enjoy freshly baked pastries, fresh and seasonal fruits, sausage links, scrambled eggs and cheddar cheese, apple-smoked bacon, turkey and ham, potatoes, freshly squeezed orange juice, Starbucks coffee, hot chocolates, and Tazo teas, and of course sparkling wine. Just reading about the brunch will make your mouth water! BATV offers more than hot air balloon flights. We also have hot air balloon ride packages that also include visits to the wineries, limo and ferry transportation, optional shopping following the post-flight brunch, picnic-style lunches, and much more! If you’re more into visiting wineries, you will visit several of 5 or 6 premium wineries. Our partner wine tour company, Napa Valley Wine Country Tours, goes out of its way to select the wineries that appeal to you and other guests. Keep in mind though, that the wineries change daily, so if you come back to do another wine tour with us, don’t expect to visit the same wineries again. This gives the tours an element of surprise and excitement! Balloons Above the Valley was the first to provide hot air balloon flights in the Napa Valley. Our pilots have years of experience so you don’t have to worry about your safety. Their experience will ensure you that you will have a safe flight. Our company staff is nice, accommodating, and will make sure that your questions regarding our service are answered, and your needs are met. With BATV, your hot air balloons flight are guaranteed to make your Napa Valley wine tours so enjoyable that you will get carried away!